Our home sits at 8700 feet with views of the Moreno Valley, Wheeler Peak, and other surrounding mountains. 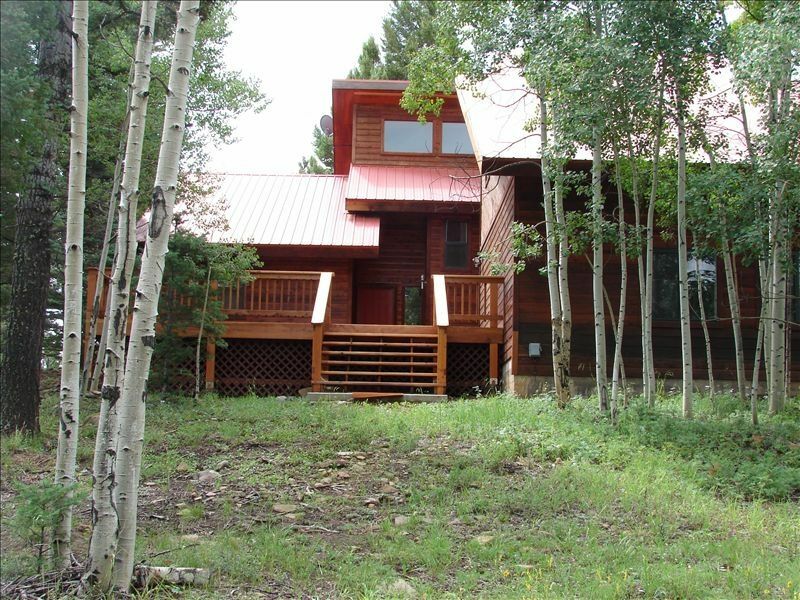 Located three and a half miles from Angel Fire Ski Resort and less than a mile from the Angel Fire Country Club and Golf Course. The floor plan offers more than 3800 square feet and will accommodate groups of up to 16 people. The large kitchen contains all the necessary appliances, dishes, and cooking utensils. The living room with fireplace, opens up to a solarium on one side and into the dining room on the other. Lots of large windows throughout to enjoy the view. The master bedroom suite has a king bed, TV, Jacuzzi tub, shower, and double sinks, it also opens into the solarium. Two bedrooms have queen beds, one bedroom has two twins and a queen with TV and Nintendo, and the last bedroom has four twin beds. There are four and a half bathrooms in the house, two upstairs, one in the Master Suite downstairs, one in the gameroom, and the half bath downstairs. The house has a large utility room with washer and dryer, it also has a second living area with gas fireplace, and high definition flat panel tv. A large deck encompasses about two-thirds of the house. Pets NOT allowed, No Smoking. We had a great time and the house was perfect! Large spacious rooms, stocked with all the kitchen items, plates, glasses, cups and small appliances you need. There were plenty of towels and blankets and seating for all. We did have a few water issues but nothing major and common for any house. One of the highlights was the deer that showed up early in the mornings in the yard. The kids were able to feed them and they enjoyed it! Great experience! Great house for 2 families. Close to town and skiing. Wish we could have used the hot tub. Our family really enjoyed our stay in Angel Fire. The home is beautiful and handles a large number of people very well. We especially enjoyed the game room being separate from the main room. Each of these rooms has nice large televisions with Direct TV and DVD players allowing us to separate the "gamers" when necessary. One thing you should be aware of when renting this property, even though it does have 5 bedrooms, one of the bedrooms is only accessible by walking through one of the other bedrooms. This limits privacy for these 2 bedrooms. The driveway is steep as mentioned, if there is snow on the ground it will require 4WD or chains. The view is beautiful and we really enjoyed our stay. What an amazing experience. Our stay at this home was unforgettable. The accomodations for our church staff retreat (sleeping 14 adults) were perfect. Thank you very much for opening your home to us. We will definitley be back.